22.2mm clamp on brake for aerobar mounting. 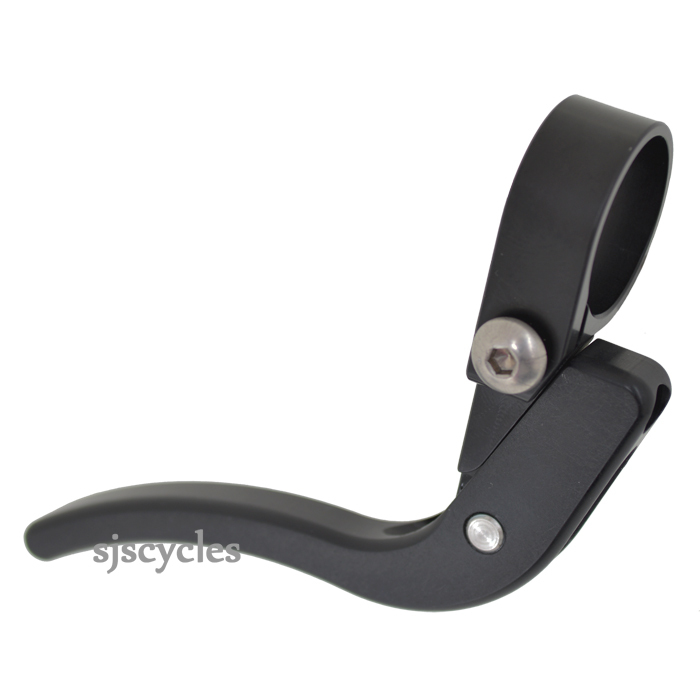 A great way to add a 3rd or 4th brake lever to your aerobars. Do These Work As Sole Braking Options? I'm looking at converting my road bike from drops to bullhorns. These would be the sole brakes for shimano calliper brakes. Are these comparable to the existing STI brakes in terms of power? Would they allow shimano 10 speed bar end levers to work in the bar ends with th cable routing? These brake levers won't quite be able to match the power of a set of STI levers due the simplicity of their design and the lack of leverage with the shorter leaver, they do however still provide plenty of power for efficient and safe braking. The lever is mounted offset slightly on the bracket for better ergonomics but it also benefits the cable routing from the shifter allowing the cable to run straight out of the shifter and along the bar without the brake lever getting in the way.